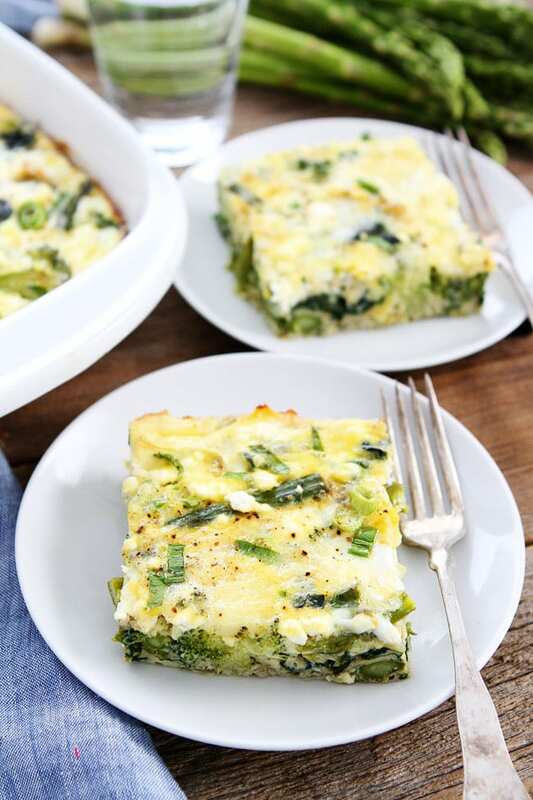 Spring Vegetable Egg Casserole-this easy egg casserole is filled with spring vegetables, Havarti cheese, and feta cheese. This post is sponsored by Almond Breeze, but our opinions are our own. Sunday mornings are my favorite because it is the one day when I don’t wake up early to exercise or work. It is my “day off.” My boys rarely let me sleep in, but I still like to stay in my pj’s and relax. We usually snuggle in bed, watch cartoons, and make a special breakfast. Yesterday, we made a Spring Vegetable Egg Casserole and it was the perfect breakfast for our lazy Sunday morning. 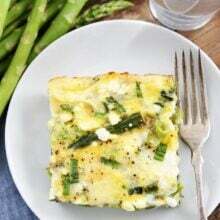 I love this egg casserole because it is super easy to make and it’s loaded with all of my favorite spring vegetables. It has asparagus, artichokes, broccoli, green onions, and spinach. Yay for green veggies! 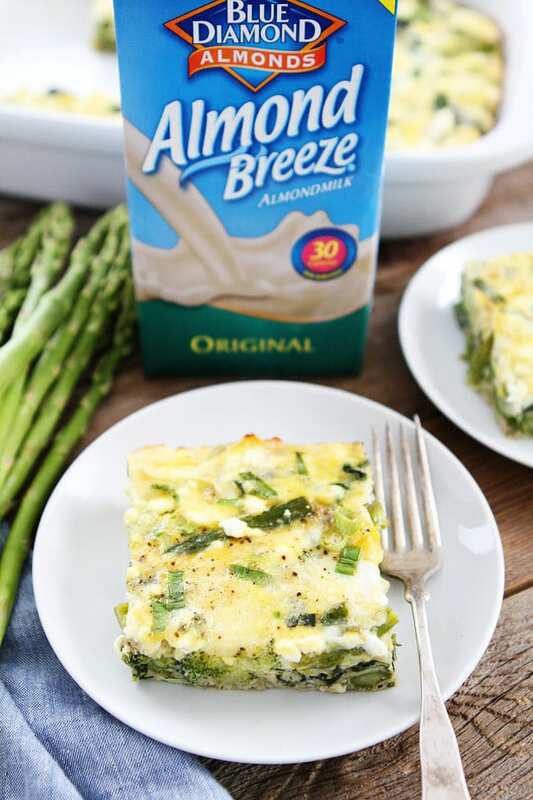 I love using Almond Breeze Almondmilk Original shelf stable milk because I always have some in the pantry. There is no running to the grocery store last minute to get milk because I am always stocked up! And I love the new, one-step, easy open twist caps! The casserole also has Havarti cheese AND feta cheese. Cheesy eggs with lots of veggies, my kind of breakfast, especially when it is so easy to make. The casserole is baked in one big pan! You can feed a crowd or reheat the leftovers. Looking for an easy and delicious spring breakfast? 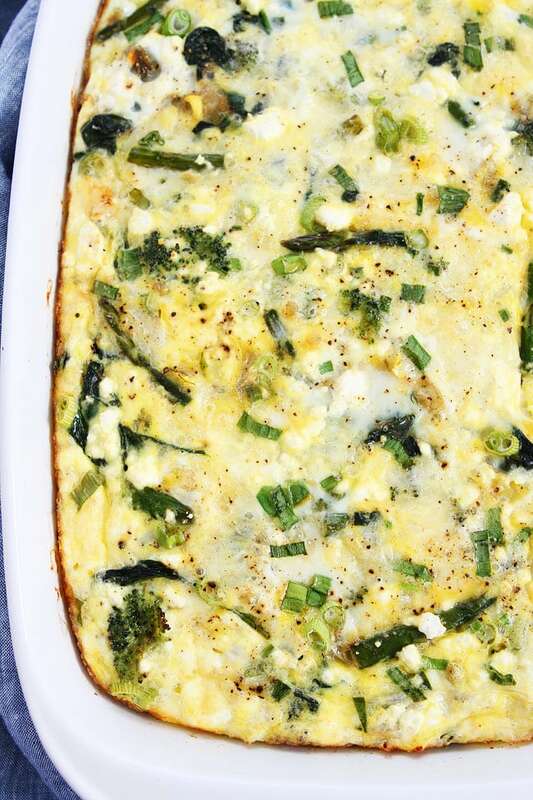 Make this Spring Vegetable Egg Casserole. And you should probably add it to your Mother’s Day brunch menu right now. Mom will love this one! 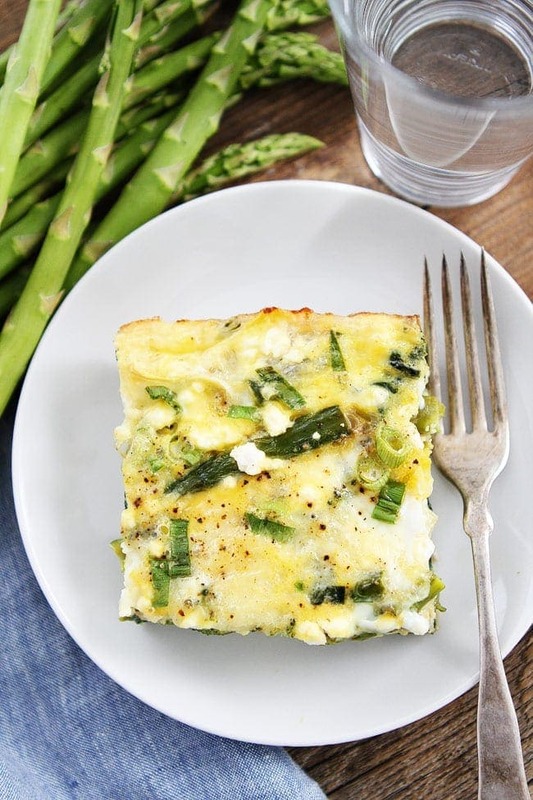 This easy egg casserole is filled with spring vegetables, Havarti cheese, and feta cheese. Serve for breakfast, brunch, or even dinner! Preheat oven to 350 degrees F. Spray a 9x13 inch baking dish with nonstick cooking spray and set aside. In a large skillet, heat olive oil over high heat. Add the onion and cook until tender, about 3 minutes. Stir in the asparagus, broccoli, spinach, and garlic. Cook for 4 minutes, or until vegetables are tender and spinach is wilted. Stir in the chopped artichoke hearts, basil, and half of the green onions. Season with salt and black pepper, to taste. Pour vegetable mixture into prepared pan and spread out evenly. Sprinkle the Havarti cheese evenly over the vegetables. In a medium bowl, combine eggs and milk. Whisk well. Season with salt and black pepper, to taste. Pour egg mixture evenly over the veggies and cheese. Top with remaining green onions and crumbled feta cheese. Bake for 30-35 minutes or until eggs are set and slightly golden around the edges. A knife inserted into the center should come out clean. Remove from oven and let cool for 10 minutes. Cut into squares and serve warm. Note-this casserole reheats well and can be made a day in advance. You can omit the cheese if you are dairy-free! I’m Maria and my husband is Josh. We share a love of cooking, baking, and entertaining. 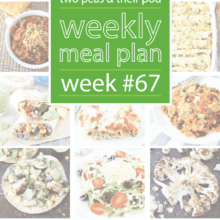 We enjoy creating recipes that are simple, fresh, and family friendly. We love sitting around the table with good food, good conversation, and good friends and family! Our kitchen is always open! This looks delicious! Pinned for later use. I can totally imagine you need some space for sleeping in by the way, Sunday morning relaxing! Love all these gorgeous green veggies — simple breakfasts like this for lazy mornings are the best!! 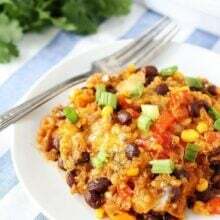 I love all of the fresh veggies you put in this casserole! 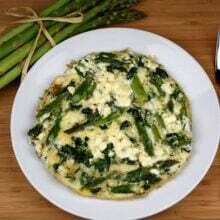 You hit all of my favorites – broccoli, asparagus, spinach, artichokes, and green onion! Seriously making this soon! What a beautiful egg casserole!! Love this for entertaining guests!! YES to brunch with two cheeses, and YES to this casserole! Making me wish I had this for breakfast! If made ahead, what do you recommend for the reheat process? Would you take the fully baked casserole out of the fridge and pop it back in the oven at 350 for 30 minutes? Want to make the egg casserole dish cooked for a trip. Send. Reheat instructions. Yes, you can put it back in the oven, but it won’t take the full 30 minutes to reheat. Maybe 15 minutes, or you can reheat in the microwave. This is going to be my dinner! I love doing breakfast dinner, especially when it’s filled with so much goodness! I adore spinach with my eggs now. So tasty and healthy too. Perfect for Mother’s Day coming up! Hello! This looks fantastic! I think it will be the perfect Mother’s Day breakfast. How much dill does the recipe call for? I noticed that it was listed in the instructions but not on the ingredient list (unless I am just completely reading over it!). Thanks! I used basil, no dill. I updated the recipe. I thought about using dill, but changed my mind. I guess my mind still thought dill when I was typing:) Sorry for the mix up! This is great…. like a frittata but without the awkward cooking method. Yay! did you use basil or dill? you mention basil in your ingredients, but mention dill in your instructions. Sorry for the confusion! I used basil! I updated the recipe. 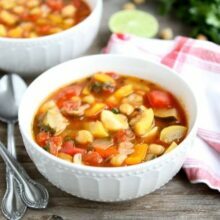 This veggie casserole is how I want to start my mornings off! © 2008–2019 Two Peas & Their Pod. All Rights Reserved.